I saw a recipe in Martha Stewart Living for "Sophisticated Fish Sticks," and I thought I'd try them! Here's a couple Framed Lady flavor ideas to try on salmon. 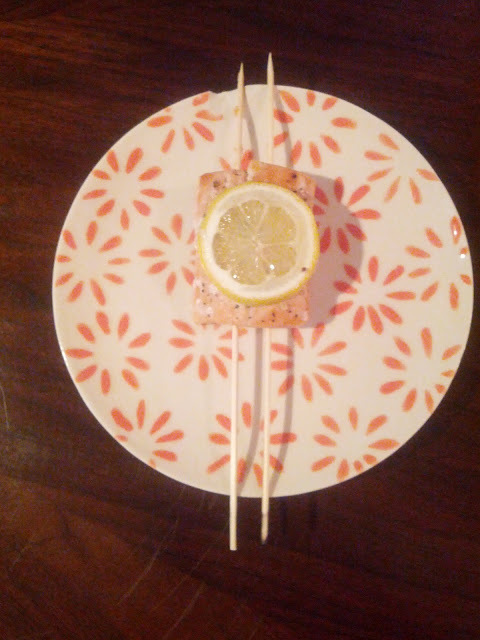 Drive 2 skewers into each salmon steak, then brush with the desired mixture! Other fish will work, but I find that salmon holds up better on the grill. Place on grill, cook for 1 minute, then flip and cook for 1-2 and a half minutes until just opaque. Top with Mango Relish or squeeze a lime over the fish, and serve with rice or salad! *These recipes are original Framed Lady recipes. I did not take any recipe from Martha. Promise. Don't forget to enter the 300 Follower Giveaway! Win lots of ad space, giftcards, and prizes!